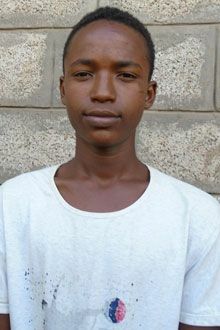 Misgana lives with his mother and his siblings. His father died when he was six month old and has no memory of him. Misgana is the third child from his siblings in his family. Misgana?s older siblings are working as a daily laborer to support the family. Also, his mother tries to support her family by working odd daily laborer. Misgana is a first grade student and is good on his education. Misgana has a scar in the center of his forehead. He scratched it by himself to show that he is a hero child. His hand was injured by iron nail and has wound upon admission. Other than that he is in good health condition. Misgana is a deaf child. There is no access to special need education where the child is residing. In addition, his family is in a difficult position to address the child?s basic and educational material needs due to their poor economic status. Tell your friends Misgana needs a sponsor!